Let’s talk a little bit about booze, shall we? 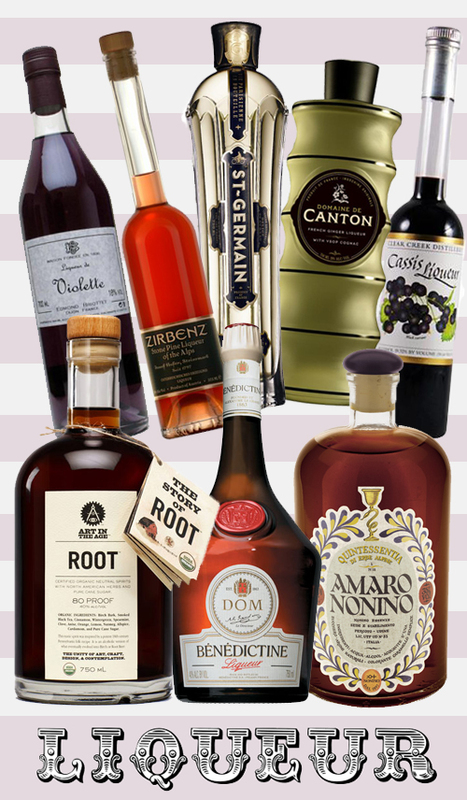 I’ve done a roundup of a few of my favorite liqueurs. I’m hoping it might inspire you to try something new for your holiday spirits! All of these are lovely in Champagne, Crémant or other sparkling wines and I’ve listed a few cocktail recipes. I would recommend trying teeny sips of each of these on their own—a few of them are aromatic with subtle flavors that are fun to experience. These also make nice gifts for foodies and hosts. Cheers! If you are in Portland–I’ve found most of these at Pearl Specialty Market & Spirits and a few of the bottles are available at regular liquor stores. This is nice in a variety of cocktails or few drops in Champagne or Crémant goes a long way! You can also try the “Aviation Cocktail”: 2 1/2 oz gin, 3/4 oz lemon juice, 2 tsp maraschino liqueur, 1 tsp Crème de Violette. Shake 1st three ingredients, strain, straight up, cocktail glass. Drizze Crème de Violette on top. Try “The Cold Shoulder”: equal parts gin, grapefruit, stone-pine liqueur + a splash of Fee’s grapefruit bitters. Shake and serve over ice. I love it in all kinds of cocktails or a splash in Champagne, Crémant. So nice in Champagne, Crémant or other sparkling wine! Also try the “Eva Peron”: 3/4 Canton, 1/4 Fernet, 3/4 sweet vermouth, 3/4 fresh lime juice. Shake vigorously and pour over ice. Top with ginger beer and garnish with lime. This works in a zillion cocktails or a little in a glass of something bubbly is amazing. Try a “ROOTnog”: 1 part ROOT, 3 parts Eggnog (pre-made or homemade!). Pour Eggnog slowly over ROOT in large tumbler or sturdy mug! My favorite way to have this is with my friend’s walnut infused cognac recipe, but it’s nice to sip on its own, too. This is my favorite amaro and it’s lovely in a lot of cocktail recipes, but I really love to sip a tiny glass of this—sometimes with an ice cube. It’s nice after dinner! Great post! I think liqueurs are overlooked by a lot of people but like you say – they’re great for adding to drinks at home to make it a little different! These are all wonderful, too! SO intrigued by the pine liqueur of the alps! I will drink and pretend to be Heidi. If Heidi was a boozer. You are going to love it, lady. I’ve been wanting a drink recipe for Domain De Canton ginger liqeur. The Eva Peron should work nicely. Thanks! I’d love to try Snap, too! Maybe you already have that one. fabulous suggestions, jen. i have st. germaine and just adore it. i’ve read a good deal about root, and have been itching to try violette and cassis liquors for some time. and the PINE-holy moley! i must have these all. thanks for the wonderful post!!! I’ve been eyeing the bottles of Canton and Root at the liquor store every time I go in. Have you tried Tuaca (vanilla)? That’s another one I’m curious about. I love all the other picks on your list and they live in my cabinet as well, soul sister. I can’t live without my Aperol (rhubarb, bitter orange, & gentian) though.